We’ve rounded up the best looks from kiddie fashion blogs (yes, those exist) and assembled a panel of expert Who What Wear editors consisting of Danielle Nussbaum (DN), Nicole Kliest (NK), Jessica Baker (JB), Evelyn Crowley (EC), and Laurie Trott (LT) to determine what makes each one tick. Read on for style tips from the pee-wee set. EC: Eccentric creative type who plays by his own style rules. DN: Joe Zee's first hire, obviously. JB: Give this boy a hand. EC: I mean, that hair. NK: The shorts are very Junya Watanabe. ​LT: I think he's jumped on the Hood by Air leggings-under-shorts trend. DN: Crazy in love…with these looks. NK: Props for the Canadian tuxedo. ​EC: Cuteness with a side of ‘tude. EC: Somebody’s ready for Glastonbury. NK: Loving the severe side part, accentuated by that chic orange barrette. ​DN: She should be jumping in puddles but who would want to mess up that outfit? EC: When it comes to bow ties, I say go big or go home. NK: I like how he contrasts the chambray with a flash of tomato red. And kudos for being on trend with the round sunnies. ​LT: Make no bones about it, he’s a dapper dude. NK: Madewell prep meets Gidget. DN: Surfer girl highlights that give Tracey Cunningham a run for her money. EC: I admire the borrowed-from-the-boys vibe that's happening above the waist. JB: Floral pants done right. DN: Newsies never goes out of style. EC: A lilac pocket square? Well-played, sir. NK: I always appreciate a good mix of high (tweed blazer) and low (combat boots and blue jeans). EC: Now THIS is French girl style. JB: Somebody’s owning the je ne sais quoi. LT: Francois Hardy by way of Baby Gap. DN: This kid’s hat slouch is more perfect than I’ve ever been able to achieve in my life. LT: Socks and Birkenstocks? Where is she getting her insider fashion intel? NK: Seriously, spot on. And I love the Baja-inspired dress. NK: Smells like…time to change this adorable outfit. ​JB: His angst matches his ensemble. NK: I love his model off-duty parka. JB: This kid’s up to his neck in chic neckwear. EC: Agreed, but should he be hitchhiking? JB: I appreciate the color coordination between her flower crown and footwear. NK: Way to master the half-tuck. JB: She’s with the band. NK: I love her high pony and Alexa Chung-inspired smokers slippers. ​DN: The cutest way to rock in-transition bangs. DN: He’s totally a Niall. NK: I’m just really intimidated by how cool this kid is. The cuff on his jeans is perfect. EC: Rugged yet suave. I see a supermodel girlfriend in his future. JB: I do, in fact, respect her. EC: Camo pants offset with a bold statement-sweatshirt. Genius. NK: Tommy Ton, we’ve found your next star. LT: Excellent layering technique, she must be reading Who What Wear. JB: Can she be my homie? ​EC: Seriously, where can I get that moto jacket in my size? LT: Channeling Williamsburg summer style. LT: Um, I think they’re huraches. EC: Baby’s first boho chic. JS: Good to know she’ll be able to wear that beanie for years to come. LT: She wisely chose a blue embroidered top to play up her eye color. EC: Minus the Velcro straps, this is exactly how my 34-year-old boyfriend dresses. NK: He’s perfected the rolled-up sleeve look. Did he learn that styling trick from J.Crew? DN: Seth Cohen chic is alive and well. DN: Totally digging his Punky Brewster chucks. JB: I like his bold use of a cuff. NK: Great way to balance a fitted skirt with a boxy crop top. EC: Somebody’s got his finger on the pulse of the sneaker trend. Want more? 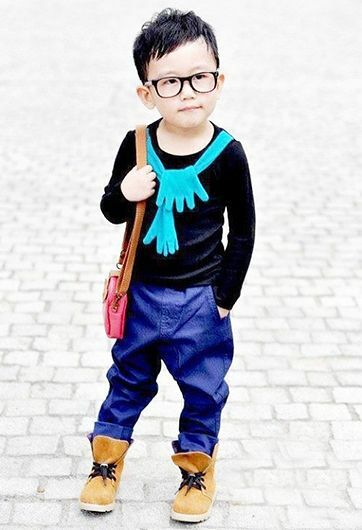 Check out kid-centric style blogs Ladys & Gents, Fashion Kids, and Children with Swag.